A growing activity for us is our PR services that we provide under the ICO Media brand. While this is a topic that we have very rarely discussed on this blog, we are developing in many ways and I might share more on the topic in the future (it is unlikely however, that I will discuss anything specific related to the work we do for our clients). So, we do PR. But as you may have noticed, I tend to like data and I value information that is backed by numbers and not just intuition. For the past year we have been developing a couple of tools in order to make the team’s work easier and/or more efficient. As a “happy accident” from the building of these tools, I have now a monitoring tool that tracks articles mentioning specific game-related terms in our database of websites (about 5,000 sites IIRC). I have been feeding the tool with specific search for a few month now and what I will share today are the results for the month of February for a number of video games and video games platform. Disclaimer The tool I am using is far from perfect. It gets hits on false-positives, some terms are impossible to get hits on and it is somewhat dependent on how clever I am when I create the monitoring criteria for a specific game if the name is quite generic. The tool is also dependent on the alerts I have entered. There are manyprominent games that are absent, mostly because my primary interest when I started working on it lied with online games. I am expending that list now, but do not take the stats as an “end all” proof that X game is totally ignored by the media. I am only sharing the graphs showing the number of articles for a given topic – we are also using a weighted value based on the sites’ reach, but this time around I wanted to keep things simple. So what you see here is relevant about quantity, not necessarily quality. It is important to note that we purge the results coming from fansites (dedicated to one game) and content farms (that just repost other websites’ content). I am just sharing the current results because I feel they are interesting at illustrating the trend for the month of February. The media like blockbusters. And blockbusters like media. Titanfall being a bit alone for the beginning of the year [arguably, I missed a few AAA that also have launches in the Q1, but let’s not focus on what is missing] and it seems normal that it is standing out so much. They had a lot of actuality as well during Feb. However, you can see that blockbusters from Q4 are still getting a lot of coverage (BF4, COD, Batman and GTA), despite having weaker announcements. Elder Scrolls Online also stands out – you can see the license in action there as it is unusual for MMOs to get a very wide coverage – with the obvious exception of World of Warcraft. Online games in general tend to get more regularly covered once they have proven their worth – as shown with WOW, but also with League of Legends and World of Tanks as well as (in its own unique way) Minecraft. It is also interesting to see that Watch_Dogs is below the coverage I would have expected – but you can see now as we are in early March, Ubisoft is cranking it up again. 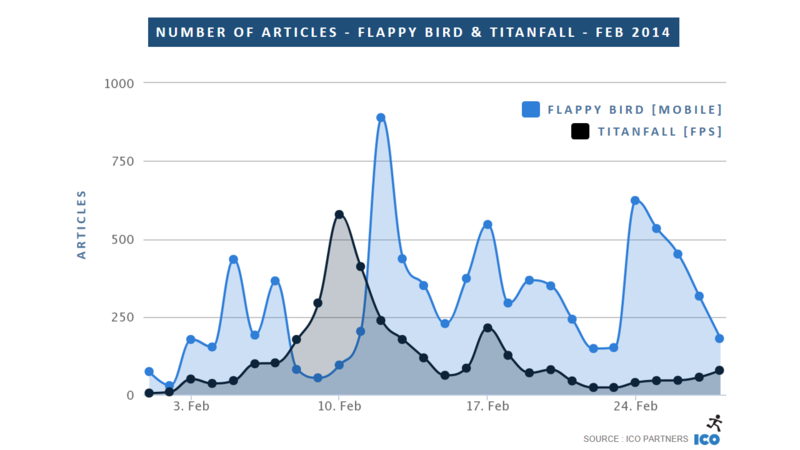 I left the obvious outlier for the end, the odd event of the month and a fascinating one from a PR perspective: Flappy Bird. I am very confident that even with the AAAs I missed (current trends for March make me think that Castlevania, Assassin’s Creed, Infamous and Dark Souls would have made it in that top 15 had I added them early enough), Flappy Bird would have had that same (second) position. It is obviously a black swan but one that I find fascinating (as anyone who talked to me in the past 4 weeks can attest). Beyond the impossibility to reproduce such a phenomenon, I still think it gives an excellent lesson in what makes media pick up a news: the story. A perfect storm… And a good lesson. We very regularly discuss with studios on how they should approach the way they present their games to the media. Way too often they are lacking the story component. Of course you need to talk about your game and what it is about, but putting it into context, presenting a narrative (the studio’s, the origin of the core concept, or anything relevant really) will make it that much more appealing for a journalist to cover it. I would advise strongly against taking this advice as a spin on “there is no bad publicity” – you will always want to be a positive story in the end. 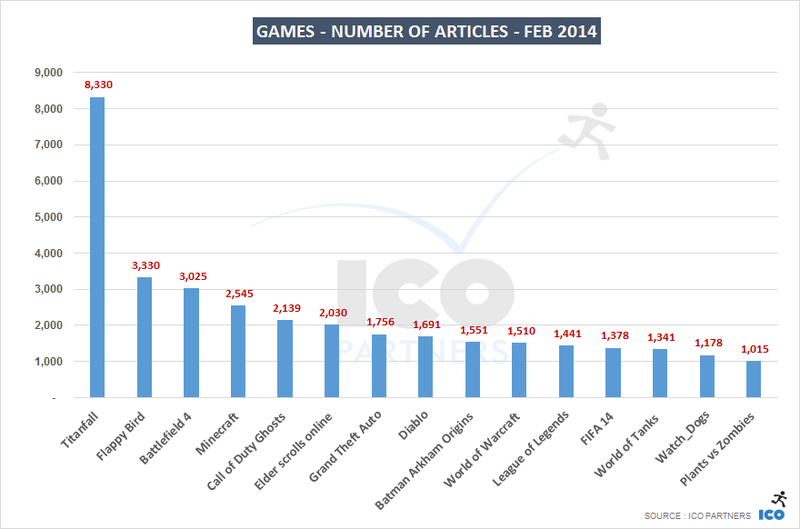 Another fascinating aspect is that the game got a lot of its coverage over a weekend. 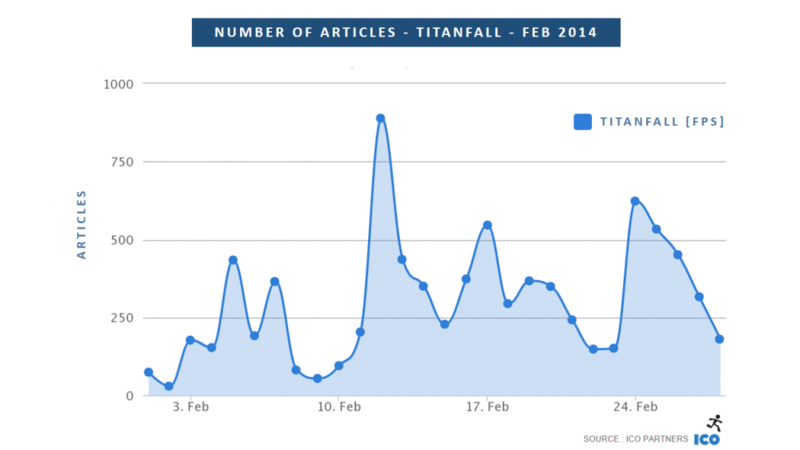 If you look at the Titanfall chart, you see the big drop that happens then. Flappy Bird’s removal started over the week-end, and it was still massively picked-up with a huge follow-up on the next Monday, where all the media that missed it played catch up. In case you are wondering what is the 17th of Feb bump related to, it comes from the news that Apple and Google were cracking down on the Flappy Bird clones. An aftershock of sort. 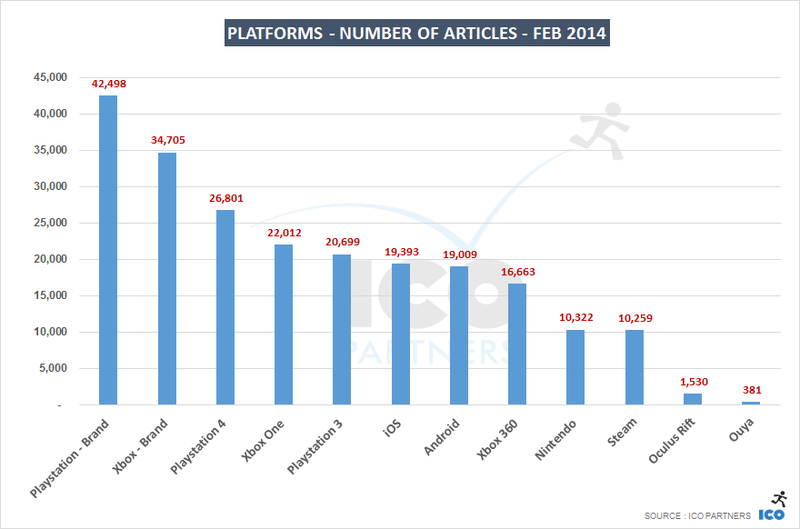 This must also be considered within the context that mobile game get very little real media coverage. To give some reference points, Candy Crush Saga, in the midst of January’s trademark debacle, had 725 stories mentioning them over the month, peaking at 172 articles on the day the story broke out. 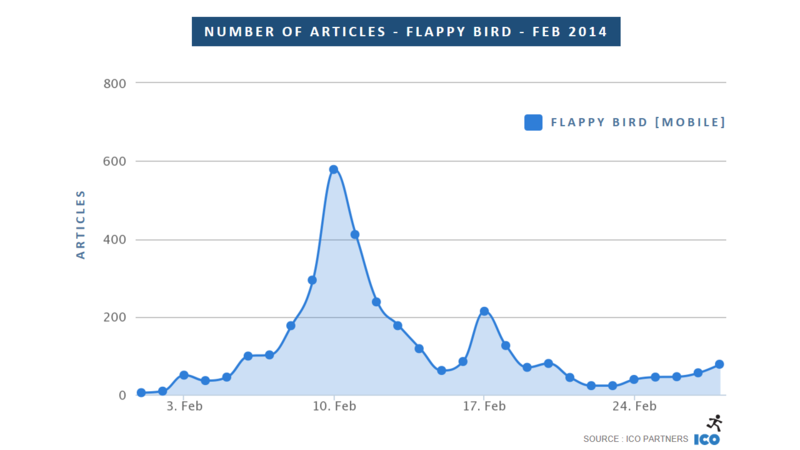 And, in a most impressive way, if Flappy Bird is absent from the app stores, it has stayed in the news. It averages at 40-45 articles mentioning it every day. That the same average you see for World of Tanks (on their quiet day). If you need to take all the previous graphs with a grain of salt, you need to take the following up with a bucket. I looked into “platforms” that are currently prevalent in the game industry and the number of articles that mention them – however, our database is very skewed towards video game website while still including a number of tech websites. So what you have here is very unrefined data, pooling things together that probably shouldn’t be pooled together. I still find that somehow relevant and an interesting check on what online media are covering. I was tempted to remove iOS and Android from the chart – they get a lot of their mentions from tech websites that tend to delve into new devices and new OS features and not be very relevant from game industry point of view, but leaving them here doesn’t do much harm and give a sense of scale for the media presence they have. Unsurprisingly, the “brands” are leading the way in a significant way. If you wonder why “Xbox – Brand” doesn’t equal “Xbox One” + “Xbox 360″, that’s because some articles mention both machines while others only mention “Xbox” without being specific about it. Our tool is covering websites from all over the Western hemisphere. With Europe and its fragmented landscape, we have way more European websites though, and the prevalence of the Playstation brand there shows in the volume of articles they get, regardless of the generation. It is possibly mitigated by Titanfall’s very strong media presence, considering the game won’t be available on the PS4 – something to research at a later date perhaps. The fact that Nintendo is getting an equal amount of coverage as Steam is very impressive of Steam (or very depressing for Nintendo? ), and clearly showing how much of a power house it has become. I would expect this to continue and the media presence of Steam to even grow with time – despite Valve’s very hands-off approach to PR. I find the Oculus Rift performance very promising. The device is clearly sparking the imagination, and the novelty factor is working for them. For reference, in February, they announced their exclusivity deal for EVE Valkyrie; shortage of components for the Dev Kit (and thus, shortage of Dev Kits); and they got a fair number of mentions from the announcement that Sony would show its VR headset at GDC. For comparison though, they had about 1,900 articles mentioning the Oculus Rift in January – that was mostly thanks to the Steam Dev Days. In any case, for a technology that is not publicly available and with no firm release date, the interest is there. I am not sure I need to comment the Ouya media coverage at this stage – but it is one I keep an eye on.